• What is all the fuss about this “108 CODE”! Is it the Pulse, the Rhythm, the Living Curvation, the True Mathematics of Nature? Is it the Essence of that which is repeatable, shareable, tangible and yet timeless, a phenomenal mathematical code that makes the invisible visible? Such a rare diamond, with never before published material. 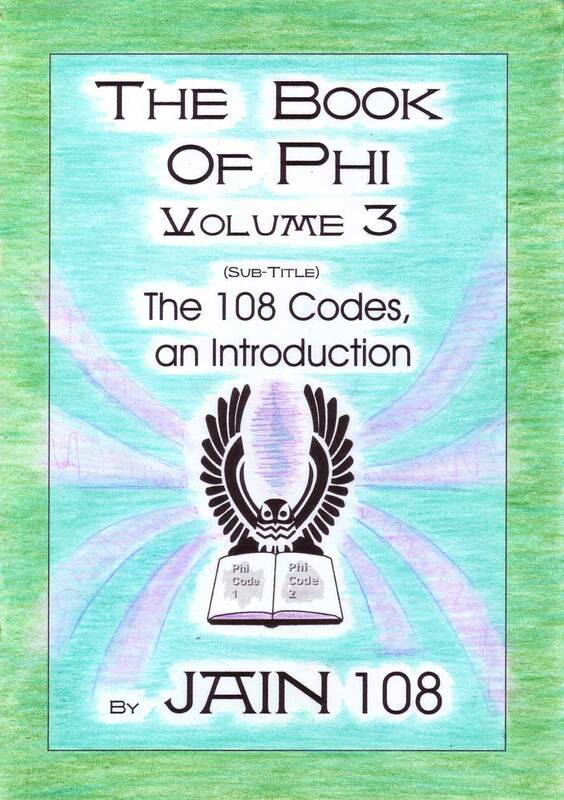 Such a vast subject, that The Book Of Phi, Volume 3 is only an introduction to the 108 CODE revealed in full detail in the next two books: Volume 4 is on Phi Code 1 (linearly based on the digitally compressed Fibonacci Sequence), and Vol 5 is on Phi Code 2 (the multi-dimensional form based on the cryptic and endlessly cyclic “Powers of Phi” and has a direct correlation with the ancient Medical Symbol known as the winged Cadduceus symbol and currently claimed by big Pharma. The release of these codes to the next generation of children is about reclaiming our Power and Love). This book contains 216 photocopied pages, is hand-written in parts but mainly computerized, highly illustrated, the book is a golden rectangle but fitted or orientated to A4 landscape , and wire bound. What is all the fuss about this “108 CODE”! Is it the Pulse, the Rhythm, the Living Curvation, the True Mathematics of Nature? 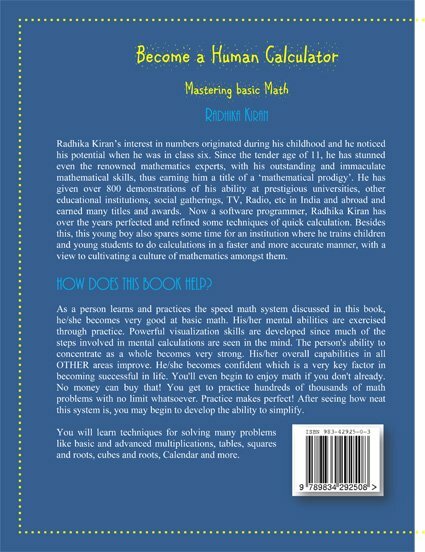 Is it the Essence of that which is repeatable, shareable, tangible and yet timeless, a phenomenal mathematical code that makes the invisible visible? 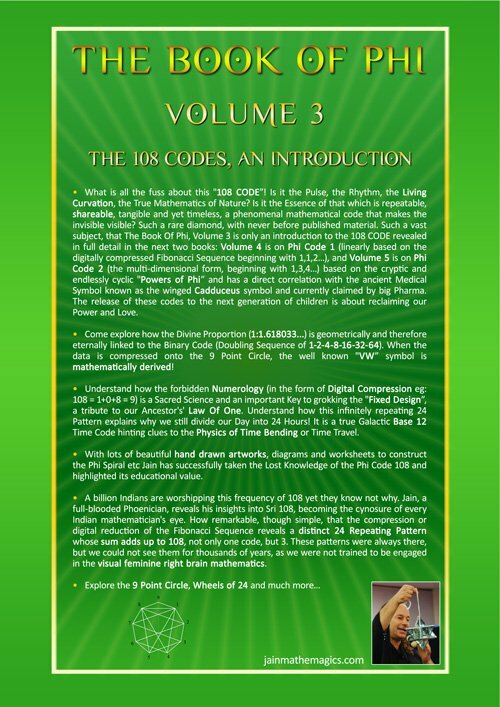 Come explore how the Divine Proportion (1:1.618033…) is geometrically and therefore eternally linked to the Binary Code (Doubling Sequence of 1-2-4-8-16-32-64). When the data is compressed onto the 9 Point Circle, the well known “VW” symbol is mathematically derived! 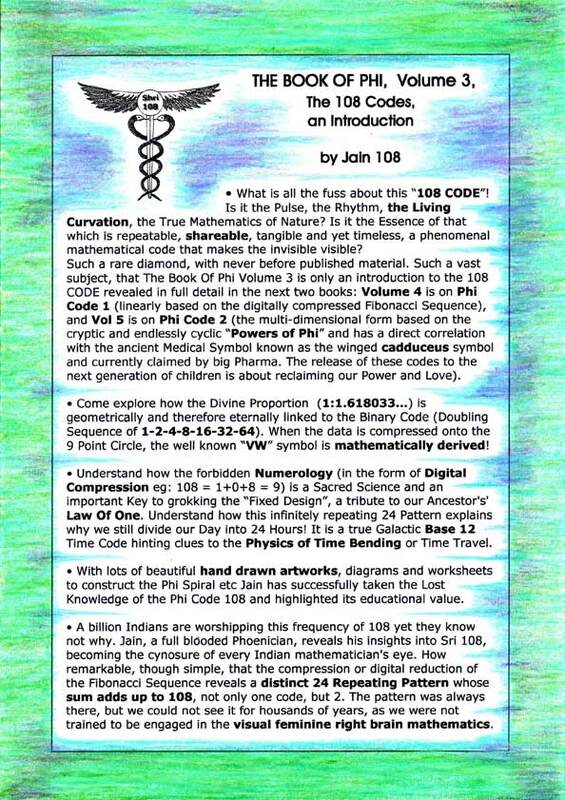 Understand how the forbidden Numerology (in the form of Digital Compression eg: 108 = 1+0+8 = 9) is a Sacred Science and an important Key to grokking the “Fixed Design”, a tribute to our Ancestor’s’ Law Of One. Understand how this infinitely repeating 24 Pattern explains why we still divide our Day into 24 Hours! It is a true Galactic Base 12 Time Code hinting clues to the Physics of Time Bending or Time Travel. 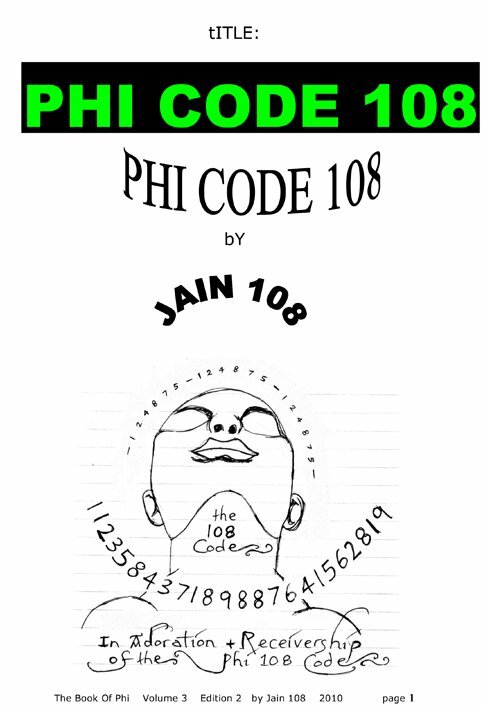 With lots of beautiful hand drawn artworks, diagrams and worksheets to construct the Phi Spiral etc Jain has successfully taken the Lost Knowledge of the Phi Code 108 and highlighted its educational value. 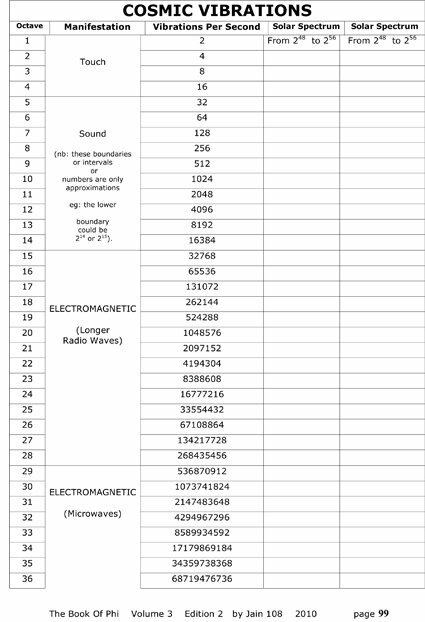 A billion Indians are worshipping this frequency of 108 yet they know not why. 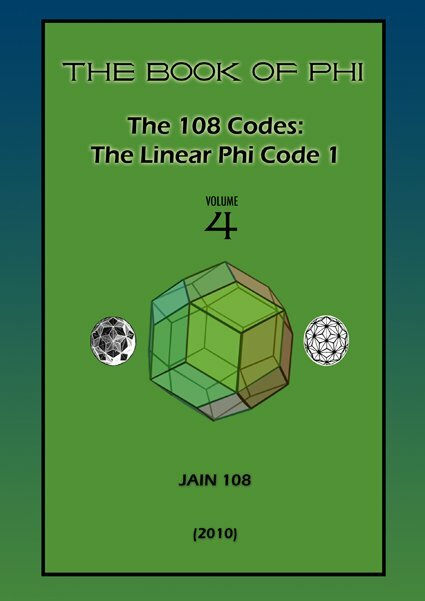 Jain, a full-blooded Phoenician, reveals his insights into Sri 108, becoming the cynosure of every Indian mathematician’s eye. How remarkable, though simple, that the compression or digital reduction of the Fibonacci Sequence reveals a distinct 24 Repeating Pattern whose sum adds up to 108, not only one code, but 2. 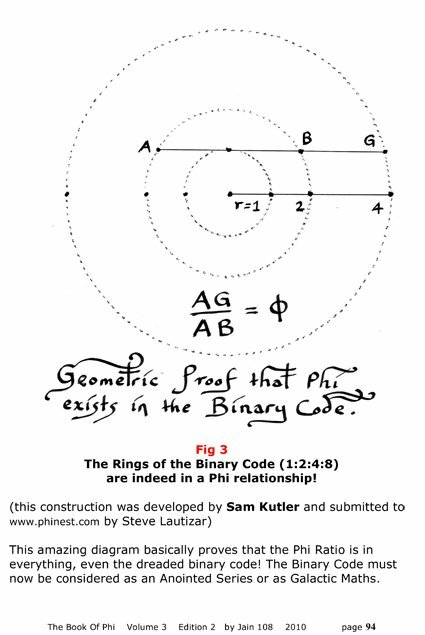 The pattern was always there, but we could not see it for thousands of years, as we were not trained to be engaged in the visual feminine right brain mathematics. 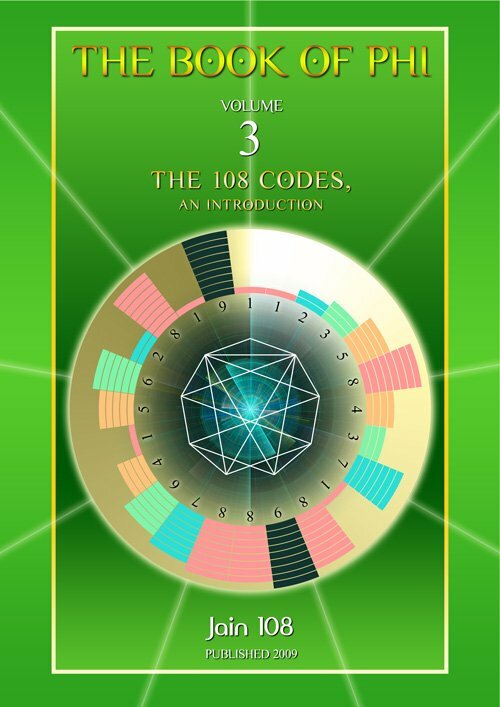 subtitled: The 108 Codes, an Introduction. 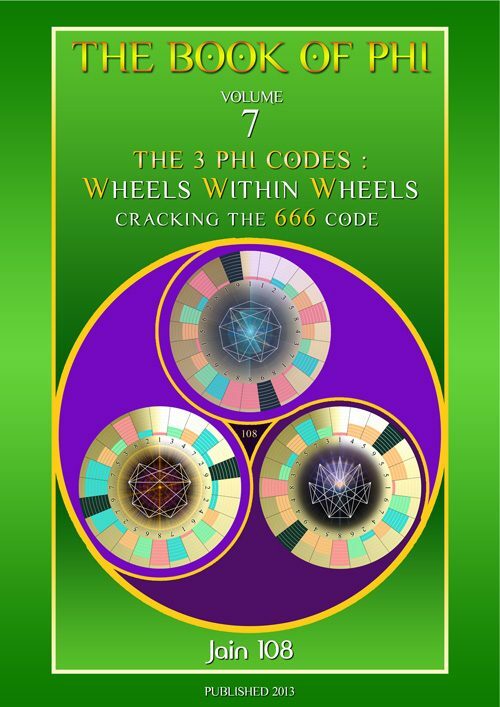 Originally written for magazine publications, a great source of information on the Phi Mysteries, Pentagram, Fibonacci Sequence and an introduction to the first 108 Phi Code. It is written in 3 Parts. 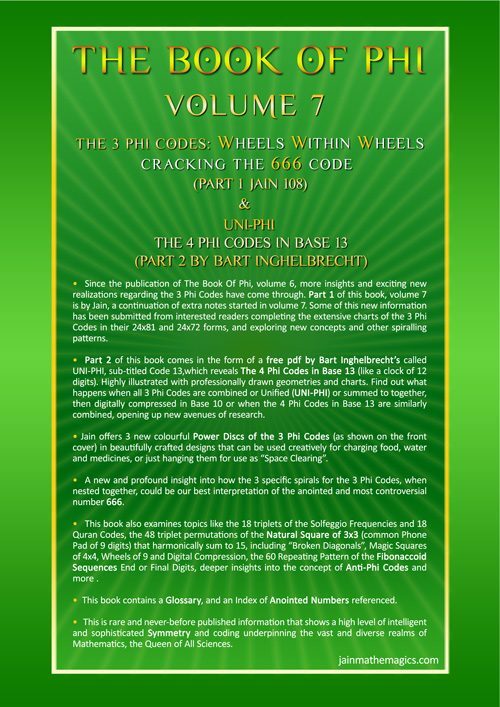 – pART 1: What You Already Know About Phi and the Fibonacci Sequence. 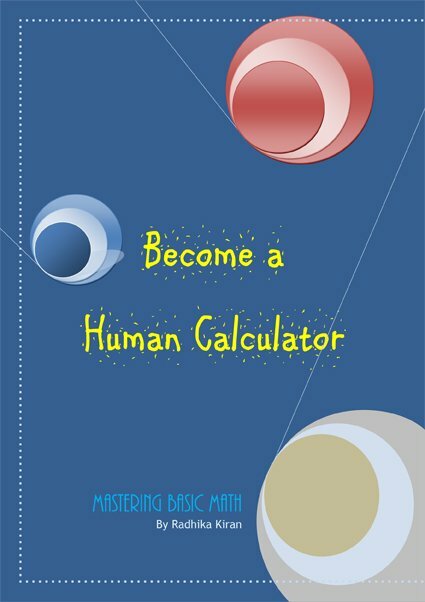 Contains lots of hand-drawn geometrical diagrams illuminating Phi. 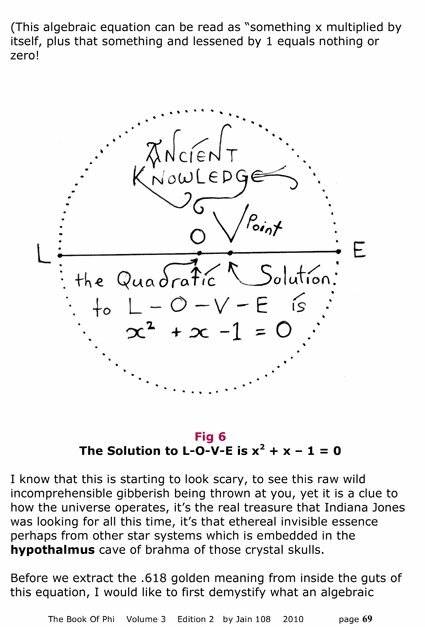 Using Letters L-O-V-E for circle segments. 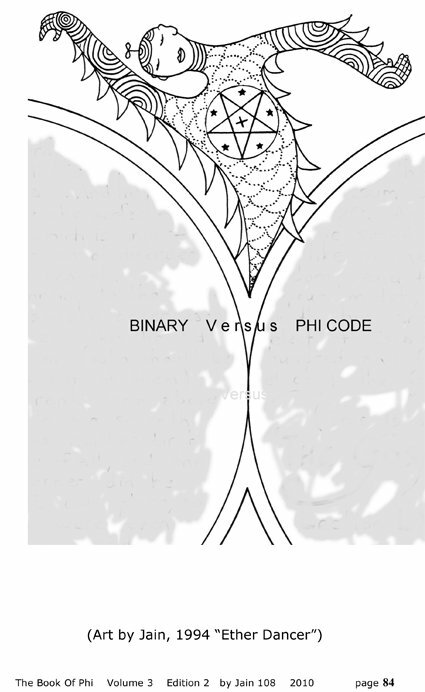 – shows an excellent diagram that proves that the Phi Ratio is hidden in the Doubling Sequence or Binary Code. – Rare Theosophical Charts of the Powers of Two describing the Electromagnetic Spectrum. – Mathematical Origin of the VW Symbol. 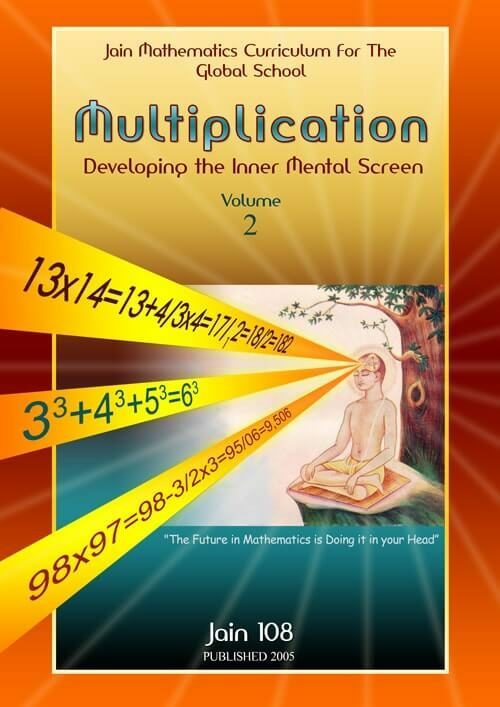 Applying Meditation and the Art of Manifestation into the step by step worksheets. An article that glorifies the greatest mathematical tool called “Digital Compression” which reveals all the mysteries, like the 108 Code, merely by adding digits as in 34 = 3+4 = 7. Simple, yet powerful. It clearly can no longer be debunked. Adoration of the Phi Code. Typical Art of Jain. Repeating 24 Code. 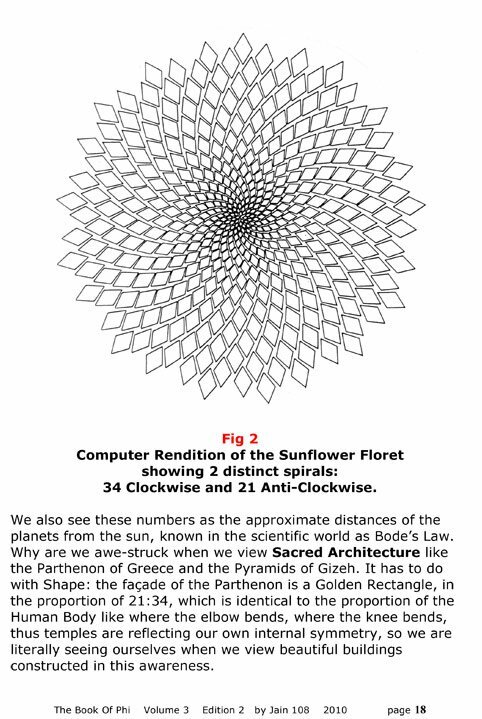 even though it is a computer rendition of the 21:34 coding of the sunflower’s floret, it still captures the essence of non-destructive embedding as a pathway to infinity macro micro toroidal unified field. 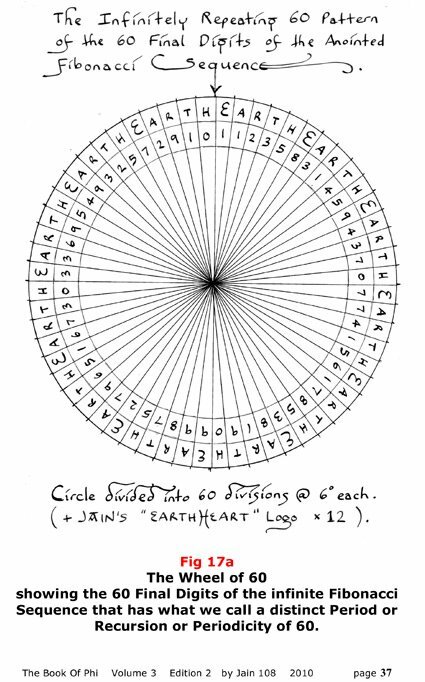 Jain’s EarthHeart Meditations based on the Toroidal Field. I was doing and teaching this at the time Drunvalo Melchizedek was teaching at the time a dangerous 18 Breath Meditation called The Flower Of Life technique, which he has now banned and warned people not to spin their fields. 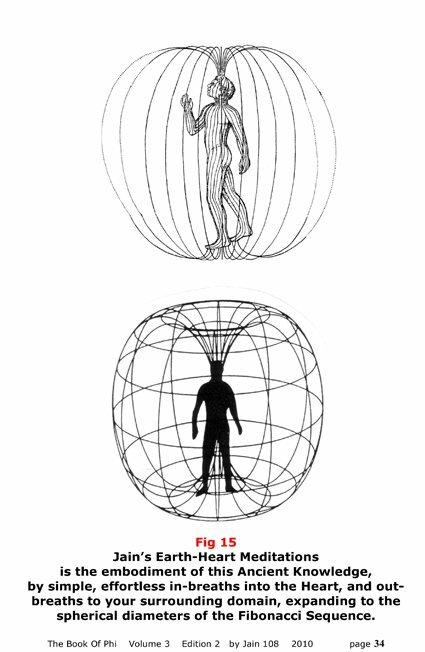 We are already spinning around the planet, we need to go into the Heart, not the Head spinning path. Avoid anyone doing these Flower Of Life meditations, they end up ripping their fabric of Time and Space and end up often in mental institutions. 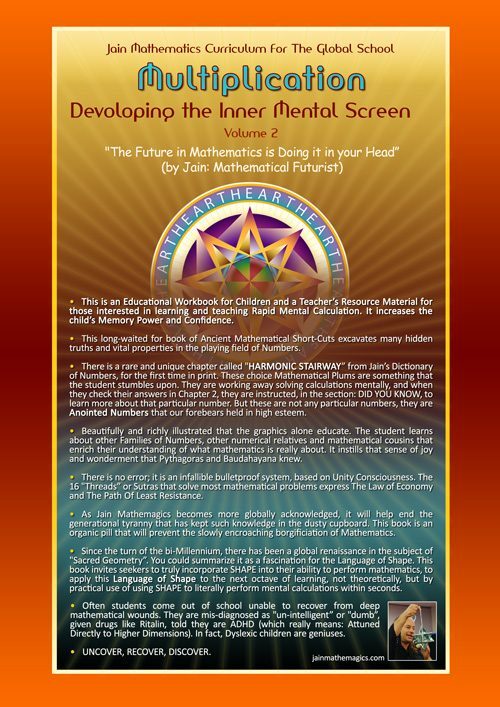 Warn your friends to never participate in such activities; often the teachers or facilitators do not even know what Sacred Geometry is, and they are merely teaching this as a form of “bread and butter” income. So be very wary. Lots of foxes out there. Sorry to be the bringer of this news, but I feel it is important enough to make this claim, as a spiritual warrior, to just breathe one breath into the heart, that is it. 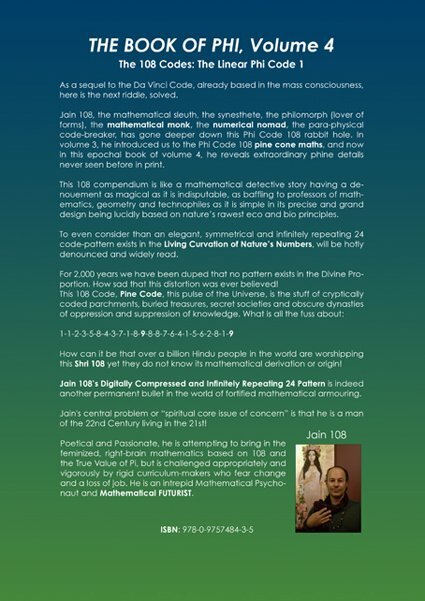 Not only is there a “108” pattern, there is a secret “60” pattern in the fibonacci numbers! Phi Ratio 1.618033… can be derived Algebraically. 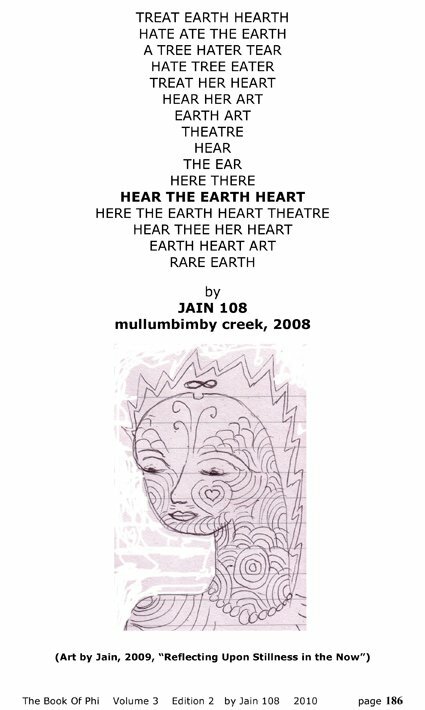 To demarcate the proportions or intervals of the Line, I have used the markers of L and O and V and E.
and “Earth Earth” to make sentences like: HEAR THE EARTH HEART.